Last update of page: 2 April 2012. The Muir family enters into Douglas J. Graham's Family Reunion through Mary E. Muir who married Frank Graham. The descendants of Mary E. Muir's father William Muir are linked together as those eligible for the Muir Educational Trust Fund. The first Muir we have a record of is William Muir, born in Scotland about 1740 or earlier. The funeral notices of his son Andrew state that he came from Creetown, Kirkcudbright County, implying that is where William lived. William was apparently born in Kirkmabreck Parish, which is the parish where Creetown is located (2). His children (see below) were mostly born in Craignook in the same parish. See also a helpful map of the parishes of Kircudbrightshire. He married in April 1774, probably in the Parish of Anwoth (6) to Euphemia McIlwraith. In the parish birth records of four of their children (5) her name appears as Milraith; the name McIlwraith was provided by (1), source unknown. In the marriage record (6) it is "Mc?". 1) Thomas, b. (bapt. unknown) 5 December 1774 (5) in Laughintyre, Anwoth Parish. 2) Elizabeth, bapt. 29 January 1781. 3) William, bapt. 7 February 1782. There are no births recorded in the parish (at least before 1851) with William as a father. 4) Andrew Muir, b. 13 March 1784 and bapt. (5) 6 April 1784 in Kirkmabreck Parish. Andrew Muir married Jean McJerrow of Ayr, Ayr County (see a separate chapter on the McJerrow family and lineage). They were married in the Parish Church of Ayr on 3 April 1821 according to the marriage certificate, of which I have the original in my possession (3). Some time in 1821 they left Scotland, sailing from Newton Stewart to Halifax, N.S. Andrew Muir and Jean McJerrow had no less than 16 children, of which 10 died from tuberculosis. The Halifax Chronicle Issue No. 62 of 14 March 1874 reports (4): "Death of an old resident- Our obituary list today includes the name of Mr. Andrew Muir, who died yesterday at the advanced age of 90 years. Mr Muir served in the British fleet under Lord Nelson in 1805 at the battle of Trafalgar, and we believe he was the last survivor in Halifax of that memorable engagement." At the time of this engagement Andrew would have been 21. It was 16 years later that he married and left Scotland; did he remain in the British navy in the intervening years? As was usual, Andrew Muir recorded all the births and deaths of his children in the family bible. In late 1981 my father and I learned that the bible was still extant and it is now in my father's possession. It had passed from the estate of Harriet Brunt to Ethel Graham to Marjorie Goodman (née Creighton) and penultimately to Norman Creighton who passed it to my father. 5) Barbara, bapt. 4 May 1786. 1) Unnamed daughter, b. 15 January 1822. "We had a daughter born, she only lived to see light". 2) David, b. 14 December 1822. He died 30 October 1898 at the age of 76. He married Agnes Anderson, b. 1825 and they had at least one child, born 15 March 1853. Agnes was still living in 1871 as she is referred to in Robert Muir's will. That will also refers to his niece Elizabeth Jane Muir, "residing with us" (which I presume to be the family home of Andrew Muir). She would almost certainly have been David's daughter because John and Allan were both still living at home at that time and in any event are not recorded as ever marrying. 3) Agnes Gordon, b. 13 August 1824. Robert's 1871 will notes that she lives in the family home. She married John Watson of Dartmouth. In Ethel Muir's 1882 letter to Australia, she notes that "Aunty Agnes" is the only girl from this family still living. She lived at that time in William Muir's house so she was presumably widowed by then. In Ethel's 1884 letter she writes: "Aunty is quite well [she would have been 60]. She spends a great deal of her time in going to sewing circles and Mission Societies. None of the rest of us like to go so we are very glad she takes such delight in it as she proves a most worthy representative of the family". She was still living in 1911. 4) Euphemia, b. 10 March 1826, d. 12 September 1826. 5) William Muir, b. 5 June 1827. William married in Halifax to Harriet Smith Wisdom (see the Wisdom chapter) on 17 or 18 November 1852. It is not known when Harriet died but she must have predeceased William as he married later in life to Isabella ("Bella") A. Knight, b. 10 November 1845. Yvette and Bill Muir have, from a member of the Knight family, postcards sent to Isabella by Inge Henderson (her step-granddaughter). According to (13) he married Isabella Anderson Knight (Carol Murray notes that the Anderson in her name is of unknown origin; it is not likely to be the name of a first husband as it appears as a middle name in her sister’s daughter) in 1894 in Halifax (William was about 67). The death occurred yesterday morning of William Muir - aged 84 - one of our oldest citizens. As a man of business Mr. Muir had been before the community for nearly sixty years. In the brisk shipping days of the early fifties no firm was better known in the province, at least where ships were built, than Muir & Blackadar - two young men who entered into copartnership, at once they had completed their apprenticeship, and carried on the trade of sail-making. For about forty years they were a prosperous firm on Caldwell's wharf, where all other materials of ships' equipment were manufactured - by the blacksmith, the spar maker, and the block maker. The decline in the building of sailing vessels very seriously affected several trades - more especially that of sail-making. Under these circumstances, Mr. Muir, in the early nineties, withdrew from his old firm and engaged in the flour and meal business, in which, up to the present time, associated with his son [Andrew], he had met with success. Always full of activity and recognized by his fellow citizens as having business sagacity, and as a man of sterling integrity, yet Mr. Muir, during his long career, managed to keep out of public life - that is the transaction of public business. He was, though, a member of the Union Engine Company, and was the survivor of the band of patriotic citizens who composed that efficient company when he became a member of No. 1 Division in the early fifties. A man of excellent judgment, and of resolute character, he, as a fire fighter, in the prime of his life, gave his fellow citizens many years of faithful, and arduous service. He and Harriet Wisdom had seven children, considered in the section below. 6) Euphemia Barbara (recorded as Barbara in the bible but occasionally elsewhere by Ethel as Euphemia Baring), b. 11 June 1829. Robert's 1871 will records her as living with her four siblings in the family home. She died 12 April 1881. 7) Mary, b. 6 January 1831, d. 19 September 1834. 8) Andrew, b. 28 November 1832 in Halifax. Long an unknown relative to me, it came to light in 1998 that Andrew in fact married and has numerous descendants in Australia and Canada. Two of his descendants, now living in the Ottawa region, Yvette and Bill Muir, tracked me down as part of their research into their family history. The Australian Muirs were certainly well known to Ethel Muir as correspondence (1882 and 1884) has come down between Ethel and her cousin Andrew Nance Muir. Furthermore, when Andrew N. Muir's son returned to Canada in 1913 he visited frequently with Mary E. Muir and Frank Graham in Calgary when Ethel was still at home and aged 23. One wonders then why no mention of this side of the family ever came down through Ethel Graham who wrote down innumerable lists and records of family? 1. Andrew Nance Muir, b. 23 April 1859 in Kempsey, NSW. He m. 11 June 1890 in Castlereagh, NSW to Edith Elizabeth Eleanor Jones, b. 18 March 1870 in Bourke, NSW. Her mother's family name was Colless. He died in about 1944 or 1945 in NSW and she died 6 August 1945 in Sydney, NSW. They in turn had four children: a daughter Esla and sons Errol, Cyril A., and Clive. We have a picture of Andrew and Edith (in their 30s?) with children Esla, Andrew N., and Errol. All these different branches of the Muirs remained in Australia but the son Cyril Andrew Muir, b. 1891 in NSW, returned to Canada as a young man in 1913 and eventually married in 1916 in Halifax to Mary Ellen MacDonald. She died after having two children and he remarried and had another three children (two of which are Yvette and Bill Muir mentioned above). Before his marriage, he visited in Calgary with his father's cousin, Mary E. Muir, then married to Frank Graham. I have copies from Yvette and Bill Muir of many letters he sent home to Australia. Much more detailed genealogical information is available on this lineage from Yvette and Bill Muir. Family names which join the Reunion from Andrew Nance Muir's lineage, at least down to the generation after Yvette and Bill, include: Murray, Preddy, Hecimovich, Doxsee, Reid, D'Angelo, Doucette, Cook, McLean, Antinucci, Copeland, and Webb. 2. Mary Margaret, b. 6 March 1861. She m. in 1881 to Patrick James Tierney and had four children. 3. Francis Allan ("Frank"), b. 14 September 1863. He married in 1890 to Clara Conley but apparently had no children. We have a picture showing Frank, his brother Andrew, and Andrew's wife Edith when they were in their 70s or 80s. 4. Essy ("Essie") Agnes, b. 12 March 1866. She m. in 1886 to James A. Mayo (1856-1936). They had three children. 5. Robert Thomas, b. 12 May 1868. 6. Clara Emma, b. 20 June 1870. She m. in 1888 to John W. MacCurley. 9) Mary, b. 28 August 1834, d. 1 October of the same year. 10) Jane McGarrow [sic; likely a spelling error, with McJerrow intended], b. 31 October 1835, d. 7 March 1837. 11) Robert Thomas, b. 7 November 1837. From the research of (4), we can quote the 1888 publication "History of the Halifax Volunteer Battalion and Volunteer Companies, 1859-1887" by Major Thomas J. Egan: "Robert T. Muir was one of those who signed the original roll calling a meeting to organise the Scottish Rifle Company, November 1859" and note that his name is also included in the "Original Roll of the Scottish Volunteer Rifle Company" signed on January 13, 1860. He was in business as a stationer in Halifax. His business was a very succesful one, established when he was in his 20's, and may have rivalled William's (4). He died 5 or 7 September 1891. Yvette Muir traced an 1871 will of Robert T. Muir of which she provided me a transcription. 12) Elizabeth Jane, b. 18 July 1839. She died 16 March 1860. 13) John, b. 27 June 1841. Robert's 1871 will records him living with his four siblings in the family home. He was the senior member of Muir and Scott, a Halifax shipping business involved with the West Indies trade. His death is noted in the bible, without a date, but it would have been before 1882. 14) Allan Fraser (although written with one "l" in the family bible, it is everywhere else recorded as "Allan"), b. 14 July 1843. Robert's 1871 will records him living with his four siblings in the family home. He took over the stationery business of his brother Robert. "Uncle Allan" was still living in 1882 according to Ethel Muir's letter. Because his death is not noted in the bible, I infer he was still living in 1898. 15) James Gordon, b. 7 July 1845. He died 8 January 1866. 16) Margaret Abercrombie, b. 5 February 1847. She died 21 November 1869. 1) Clara Maude ("Maude"), b. 6 July 1855. She married a Norwegian, Oscar Hillmore Hendersen, sometime after 1884. In Ethel Muir's April 14 1884 letter to Australia she writes "Captain Hendersen (Maude's young man) has been in Halifax the last week or two but he will be off again tomorrow. I expect Maude will be rather lonesome when he first goes, he has been at the house so much". 1. Ingeborg E. ("Inge") Hendersen, b. 1890, died in 1917 unmarried. Inge was visited in England by Cyril and Clive Muir (her Australian second cousins) and they were quite taken by her. She was engaged to a widower, was an ambulance driver in Bordeaux during the War, became ill at that time, and died during the great flu epidemic of 1917. While she was ill, Clive visited her at her mother's home in Findhorne, Scotland (1). 2. Edith McLeod, b. 1892 in Hong Kong on board a ship. She presumably always lived in Vancouver (from addresses in 1955, 1963, 1970). She m. Harry Rowe late in her life and had no children. They were living in Vancouver, B.C. in 1970 (10). My father remembers visits of she and the older Harry to Ollie's home in about 1945-1947. 2) Ethel, b. 1856. At the time of her 1882 letter to Australia (aged 26) she was living at home in Halifax and writes "I have been teaching this last year at the Cambridge House, Mrs. Dashwood's Establishment. It is our aristrocratic Halifax Boarding School. I like the school very much. Mrs. Dashwood is just lovely. We have our holidays now we do not go back until the first of September. I am going away to Truro as soon as May returns to be housekeeper". Ethel was still at the same school two years later when she wrote again to Australia. Ethel was the first woman to graduate (to obtain a Ph.D?) from Cornell University. Her Ph.D. thesis was on Adam Smith. From 1919 to 1933 she lived in Painesville, Ohio where she was head of the Philosophy Department of Lake Erie Women's College. [My father and sister Janice put together much more information on Ethel; this remains to be found and added]. For at least 25 years she was involved with Dr. Wilfred Grenfell's work in Labrador. She was involved in starting schools for children along the Labrador coast. Her niece, Ethel Graham, would later also work with Grenfell. Ethel Muir died 17 November 1940, unmarried. She left a sizable estate and one of the provisions of her will set up the Muir Educational Trust Fund which provides education bursaries for all descendants of William Muir. 3) Elizabeth Jean ("Jean") ("Elizabeth Jane" in several notes from Ethel Graham but definitely Jean Bayer in a letter written by Ethel Muir in 1882), b. 11 February 1860. She married on 27 September 1881 her second cousin, Rufus Osborne Bayer (from the Wisdom lineage), b. 26 October 1833. In the 1882 Ethel Muir letter, she notes "on the 27th of September Jean was married to a Mr. Rufus Bayer. He was almost twice as old as Jean being forty and she twenty one but Jean always said she intended to marry an old man and now she seems as happy as possible. Rufus is very nice and very comfortably off. I miss Jean very much she was my particular chum and to have her and Andrew both go away has just spoiled our house altogether". In an 1884 letter, Ethel notes that "Jean and baby were over to see us this morning. Hattie is just as cute and pretty as ever she can be, she looks almost as big as her Mother. Jean is very small although not quite so short as Maude". Rufus was a Bank manager in Pictou (1) but they probably also lived in Halifax at some time. Rufus had a large and valuable gun collection which on Hattie's death was given by Ethel Graham to the Halifax Armory, or some such institution (7). She died in 1937 (or perhaps 1938) according to (8); in 1929 according to (1). It is unsure when he died but in 1917 only his wife is listed as a relative of their son Rufus (WWI attestation) so he was probably deceased by then. Rufous and Jean had two sons and two daughters. 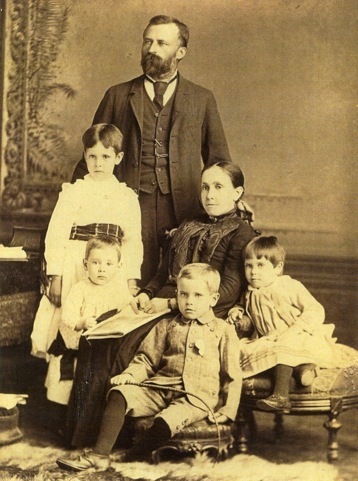 The picture below is of the entire family; I infer that the children are, from left to right, Harriet, William, Rufus, and Jean Gordon. 1. Harriet Muir ("Hattie"), b. 17 June 1884. She married Howard Brunt; they had no children. She was widowed and lived at Sainte-Anne-de-Bellevue, Québec (she was there in 1955) till her death in 1967 in Montreal. Harriet and her cousin Ethel Graham were quite close. The family bible of Andrew Muir was in Hattie's estate and passed at her death to Marjorie Goodman, a distant relative on the Wisdom side, but who happened to be also living in Montréal (the bible eventually ended up in my father’s possession; see above). Ethel Graham settled Hattie’s estate and several pieces of furniture from Hattie's home in Québec were eventually purchased by my parents and are still in their home: a glass fronted cabinet, a card table, a walking stick, and other treasured antiques. “none of this relates very directly to why you, Janice, should be the keeper of Harriet’s walking stick. Here is a major reason – Harriet was a dear friend of your Great-Aunt, Ethel. Ethel respected her opinion and admired her as a person, however now there is no one to remember Harriet. She had no children, and the few cousins who knew of her, have died; also, her many friends have passed on or, in senility have lost the memory of her among their childhood recollections. She had a rich, eventful, and meaningful life, yet it will be utterly lost unless there is a keeper of her memory. To be forgotten absolutely, is to never have been”. The book contains a wonderful photo of Harriet as a small child (she is also in the photo above with her parents). The photo here is of her as an older woman. 2. Rufus Osborne, Jr., b. 10 May 1886 (according to 1901 census). He is the picture above as a small child. His WW1 attestation paper can be found at Ancestry.com in the database of “Canada, Soldiers of the First World War, 1914-1918”. It is dated April 7, 1916 and at that time it states he is a banker, living in Tweed, ON. It gives his birth information as 15 September 1884, in Halifax, but the 1901 census information seem more reliable. His closest relative is his mother, Mrs. R. O. Bayer, living in Rockingham, NS. The paper includes a fuzzy bare-chested picture of him, apparently from a boxing match. He married Edith Lee (8). They had no children. He died in 1932. 3. Jean Gordon, b. 4 April 1889 (1901 Census). She is the picture above as a small child. She died unmarried in about 1944. She was a professor of English at the University of Saskatchewan. She was a close friend of Ethel Graham, a first cousin to her mother. She got her M.Sc. from the London School of Economics (1). 4. Harold ("Harry"), b. 1889, died in 1895. He is in the picture above as a small child. 4) William, b. 1861 ( or 1863 or 1860, all according to 8). He died as a young child in 1869 (or 1862). 5) Andrew Muir, b. 1864 (or 1860 or 1862 according to (8)), is the ancestor of all the living descendants of William Muir other than those on the Graham side. Andrew was born in Halifax. According to an 1882 letter from sister Ethel, "Andrew [who would have been 18] managed last September to obtain a good situation in Geo. Munro's office New York and of course we all felt his leaving home very much indeed; he remained in New York about six months when he got the idea he would be much more likely to make money if he went out west so now is out on a farm in Dakota living in the most primitive and, I should say, most uncomfortable style imaginable however he seems satisfied but Mamma keeps hoping every time we get a letter from him that he will surely be tired of it the next time he writes and be starting for home". It would have been only a few years later that he helped quell the Northwest Rebellion ( the 1885 Riel Rebellion).The first source for this record of service (4) is the "History of the Halifax Volunteer Battalion and Volunteer Companies, 1859-1887" by Major Thomas J. Egan, 63rd Battalion of Rifles, Halifax NS 1888. On p. 65 we find: "In 1885 a provisional battalion, composed of detachments from the first Garrison Artillery, 63rd Rifles and the 66th Princess Louise Fusiliers was ordered out for duty in the North West Rebellion. Among the Privates of the Battalion was one Andrew Muir." (There was also a Frank A. Bayer listed but not known if there is a link to our Rufus Bayer). Private Andrew Muir was awarded the North West Rebellion medal in 1885 at age 23 (9). According to his father's obituary notice, as a young man he joined his father in the flour and meal business. Would this mean that he returned to Halifax after his travels out west? Again according to this obituary, on his father's death in 1911, when he was 47, he left for the "North-West". His living children would have then been aged from 13 to 17. Thus, after several generations of Muirs in Nova Scotia, William Muir's branch of the Muir family moved west. He died in 1941 or 1942 at the age of 78. He was married to Annie Laurie Durfee (1865-1937) and they had four children who are described below. Mae was the sixth child (and second last) of William Muir and Harriet Wisdom. Born in 1867 in Halifax she was secure in a well-to-do home. Such Haligonian families were more protective and supportive than loving, yet Mae received much attention for she was obviously the "bright one". One hundred years later, Mae's youth is hidden by Nova Scotian hoar, or was it a family smoke screen? I suspect that her youth was hidden to cover her marriage and a broken marriage - all that her children related was what a wonderful mommy she was, but by then she was 40-50. Mae had a good schooling and some training as a teacher - not much was required in the late 1880's. When she was 19-20 she went into the Nova Scotian wilds to teach. She chose the Stewiacke area - a district very much in need of the gifts of learning. It was not just pioneer experience that she sought, but also escape from home. She was only 20, but burdened with problems. Her home seemed to be a nest of old maids (Maude was 32 and Ethel 31). She was smart yet there was no place for smartness in her Haligonian society. She was crippled - from adolescence her scoliosis had developed steadily. Everyone was too attentive, too protective. She went to teach and to do good. She was quickly swept off her feet by a good looking ne'er-do-well name of Frank Graham. Mae was about 21 and Frank was 32 years old. I don't know that he was a ne'er-do-well - only that he was a hill-billy. His father had taken three or four of his sons and gone off into the hills (some 15 miles from the civilization of Stewiacke) after the death of his wife, Rachel Creelman. I don't know what Frank had been doing before he was 32, before he had his eye on young Mae. More than his eye on Mae, because early in 1890 (before she was 23) she discovered or suspected she was with child [Let me add about Frank he was good-looking; from good stock (his Grandpa was the Reverend Hugh); and God-fearing. He just wasn't that bright]. Away Mae ran to her home in Halifax. Her Mother and Father said "you've made your bed...". Frank came to Halifax and they were married - just after Mae missed her second period. Their first child, Ethel, was born seven months later. They were not living in Halifax, but rather in New Glasgow. Marg and I suspected the above sequence of events, because we couldn't understand why a well-educated girl would marry "below" her social standing. In 1994 we dug out the marriage and birth records. We haven't uncovered a sin, but there was enough shame for all the Muirs and later Grahams to share. The situation got worse. Frank Graham couldn't hold a job. The evidence is indirect (hindsight, etc.) but I suspect he was a drinker. He possibly felt he had married money enough to cover his bar tabs. Mae was not about to ask her father for help. In ten years five children were born, and Mae worked at odd jobs to support her family. Finally, she opened a home-based school , in New Glasgow, Nova Scotia, where she taught her children and other children. Her school teaching was very religious yet non-denominational and non-institutional. She taught a strong moral code, and a love of learning. She was a leading light in the temperance movement. What happened in New Glasgow in 1908? We will never know. Mae moved her five children (18 to 8 years old) to Calgary. I'm not even sure Frank was with them, but if not, he soon followed. Mae must have had support from her father over the next decade, because there is no mention of Frank having a job. He finally went west and evangelized in the west coast logging camps. Mae died in 1920 but Frank lived on till 1928 (died at 72). Their five children never spoke of their Dad, but all of them were devoted to their mother. The kids all leant to love books and learning, but her other lessons didn't stick; four out of five were alcoholic, and the same four were irreligious. Ethel, the odd one out, remained close to her Mother during her fading years, in Vernon, BC, and was present at her death, aged 53. In June 1919, her daughter Ethel returned from Labrador to join her mother having heard she was ill. They both lived in Vernon, BC for that winter but in February 1920 Mary caught a chest cold which soon developed into pneumonia. She died 13 February 1920. She is buried in the Vernon Cemetery. If we have a kindness, a flower or a cheerful work, let us see to it that it is given while the house is inhabited, and not wait to throw our flowers on the empty tenement that will soon decay and crumble to dust. For the soul fares on for ever and the kind word or deed will live through eternity itself (Vernon, December 1919). Come down in the morning, Sniffing Christmas cheer; The thought crowds in upon us, "I wish the boys were here." Shake the tree for presents Did I see a tear? What can be the matter? Oh! If the boys were here. Hear the turkey sizzling, Dinner time is near; Things would be a-humming If just the boys were here. Sit down at the table, See things disappear; But they would go more suddenly If the boys were here. Gather round the fire, Evening drawing near; And still we keep a-thinking, "Say - if the boys were here." And then the thought comes o'er us: "Why all this anxious care?" We soon will be exclaiming, "Hurrah! The boys are here!" 7) Agnes Gordon, b. 1 August 1870. She died at Bedford, Nova Scotia in November 1939. Agnes collected some family information, most of which is incorporated into this web site. Andrew Muir (1864-1942) himself, his wife Laurie Durfee, and his father William Muir and the earlier Muir ancestors are considered above. The descendants of William Muir are united in their shared eligibility for the Muir Educational Trust Fund. They are all descended from two children of William Muir. The "Graham line" of the Muir Fund is descended from Mary Muir (Andrew's sister) and Frank Graham. The children of Laurie Durfee and Andrew Muir and their descendants constitute the "Muir line". All living descendants of Andrew are descended from his son Gordon Muir or from his daughter Laurie Klemm. All these descendants are today for the most part concentrated in British Columbia and Ontario. According to his father's obituary, published in 1911 when he was 47, Andrew Muir left at that time for the "North-West". It is presumed he was living in Halifax until then and where exactly he moved to is uncertain. His living children would have then been aged from 13 to 17. Andrew died in 1942 at the age of 78. 1) William K., b. 1892. William K. drowned in 1908 when he was sixteen, presumably in Halifax. Drag them from the dusty cellar, Put them up and make them fast, That is all you know of winter, Your salute to summer past. When the roots stir in the darkness, Take the spotted window down, That is all you know of winter, In the sad and narrow town. 3) Gordon Muir, b. 1896 (or 1898?) and d. 1952 (or 1941? definitely deceased by 1955). He was married to Ivy Austin and had five children, considered in the sections below. Their eldest son Sherlock was brought up separately from the other four siblings, by Ivy's parents in Calgary. I have no other information on Gordon and don't even know where he lived. His eldest son was born in Calgary in 1918.
i) David. Since 1970 David has been one of the two family trustees of the Muir Educational Trust Fund. 2. Peter Klemm, b. 1931. Much of the material here on the Muirs comes down to us from the notes of my Great-Aunt Ethel Graham (this is generally the source for all otherwise uncredited information). For William Muir and his descendants, much of the information would have been well known to her (William was her Grandfather). We know also that her Aunt Agnes, a daughter of William, collected some family information which would have been passed down to Ethel. Ethel's written material however rarely included anything but the barest of genealogical data (and even these often differed from scrap of paper to the next) and so even for her aunts and uncles we often know very little about them other than names and birth dates. For William Muir's Scottish ancestors, Ethel had only the scantest information and there actually is very little original supporting material. I have in my possession the records from the family bible of Andrew Muir and Jean McJerrow, a three or four line newspaper obituary of Andrew Muir, a will of Robert Muir, and a one page newspaper obituary of William Muir. Some additional material that has come to light since my original book is thanks to the research and records of Yvette and Bill Muir. They have extensive family records and information about their ancestor Andrew Muir (who went to Australia) and his descendants. They also discovered the McIlwraith connection. They also provided two letters of Ethel Muir written in 1882 and 1884 to her Australian cousin Andrew and these include some interesting information on the family in Nova Scotia. Additional information on Scottish Muirs has kindly been provided to me by Tom McIlwraith who dug up parish records and related information on my behalf in October 1998. The above text on recent Muirs is mostly based on a transcription of material originally included in the 1982 A Family Reunion. It has been updated to the extent possible. Unless otherwise noted this information has come from my own contacts with various members of the family. A great deal of additional information is now available on the recent members of this family, in part because of the need to maintain records for the Muir Educational Trust Fund. However, for reasons of confidentiality, this information is not posted here. (1) Information provided by Bill and Yvette [ID-141] Muir in 1998; early Scottish material presumably from a search of parish records. (2) (1) note he was born in "Kirkmabreck, Glentown" (source?). I don't know what the Glentown would refer to, this is not a parish in that county. In the parish records for births in Kirkmabreck (sent to me by (5)), the only birth of a William Muir recorded is that of William, b. 11 February 1719 in Brooch, son of Robert Muir. This could be our William but he would have been in his 60s when he had his children with Euphemia. (3) Andrew was married in Minnigoff [sic] according to Yvette and Bill; this seems clearly wrong as Minnigaff is a parish of Kirkcudbrightshire, well south of Ayr. (4) Information provided by Bill and Yvette Muir in 1998. (5) Parish records in Kirkcudbrightshire (provided by Tom McIlwraith in October 1998). (6) According to (1), they were married in the Parish of Anwoth but according to (5), their marriage appears in the parish records for Kirkmabreck (William Muir of Kirkmabreck Parish and "Euphemia Mc? ", parish not noted). This may have been noted in error by (5)? (7) Recollection of my father, William Muir Graham (1998). (8) Hand-written notes of Ethel G. Graham on various scraps of paper in her family files. (9) This information found by Bill Muir in National Library or National Archives who reports source as: "Reel C15730 Index to Medal Registers N W Reb 1885 RG.9.11 A5 vol ii Reel C-1863: "Pte Muir, Andrew Awarded North West Rebellion Medal, 1885" and from the NWR Medal List: "Muir, Andrew Pte Halifax Prov B Age 23 1 Annandale Certificate No Mil. & Def. 1353". See Folio 118 N W Reb'n Canadian Militia Unit Roll. (10) List of descendents of William Muir (for the Muir Educational Trust Fund) dated May 1 1970, presumably prepared by Ethel Graham. (11) Personal communication, David Olsen (1994). (12) Personal communication, Carrol Nicholls, August 2002 (she provided some recent family history and a family tree). (13) Personal communication, Carol Murray (ID-396), March 2012, on Isabella Knight, her great-grand-aunt.